When it comes to the premier trout waters of the South-West, angler’s thoughts turn to Chew and Blagdon. 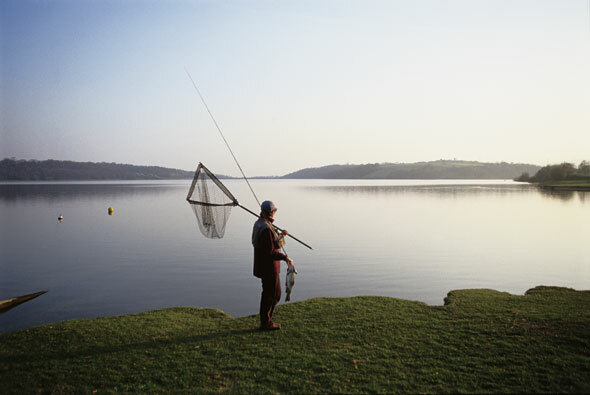 Yet a few miles away across the Severn Bridge in South Wales is a reservoir just as capable of growing on superb fish – Llandegfedd Reservoir. Surrounded by green hills, and enjoying a mild climate, Llandegfedd is worth of a place among the country’s best trout waters. Regular Ceri Jones gives the visitor a run-down of all the best bank spots. April: Black buzzers are the main food source for the fish at this time of year. From the end of March through to the beginning of May the buzzer fishing is at its best. The natural is black, but patterns in black and also claret are the best to use. Superglue Buzzers and Hoppers in these colours take many buzzer-feeding fish. May: Black buzzers will still play an important part, but now the small green buzzers will also be active. Good top-of-the-water sport can be enjoyed, but if the fish get preoccupied with these it can be frustrating. This is also the month for the Hawthorn and sizable patterns on a size 10 such as Bibio, Black Hopper and of course the hawthorn imitation greased up are among the top fish takers. June:This is when the pin fry start, and a great time for seeing lots of feeding fish in the margins. The sight can be unbelievable when hundreds of rainbows around the lake feed all day, mopping up these large shoals of pin fry congregating around the banks. Green Pool & Sor Bay are among the best areas at this time. The Silver Invicta and PTN are probably still the best patterns to tempt these sometimes-difficult fish. July/August: More often than not, as is the case with most waters across the country, this time of year can see sport slowing down through the day. However those anglers staying on into the evening will reap the benefits. Sedges will be the main item on the fish’s menu; GRHE patterns are also a safe bet to take a fish or two. September: Probably the best month for surface-feeding fish, a great time for fishing dries. All the popular patterns such as Hoppers, CDC Shuttlecocks, Bits and Shipmans will take fish. The Daddy Long Legs will now be an important pattern in the angler’s armoury. October:Llandegfedd doesn’t experience the frantic fry-feeding activity enjoyed at other reservoirs, and the insects now start to get thin on the ground as the water temperature drops. Lures such as Viva, Cat’s Whisker and oversize Olive Tadpoles will now be your first line of attack. A GOOD area for stockies. Fish seem to hold and run along the Gabien Wall. Popular early season, but difficult to cast good distances because of the wood behind you. There are breaks in the trees along this bank for easy back casting but most of these spots are taken up, so it pays to get your spot early if you plan to fish here. Take a landing net with a long handle, as it can be tricky netting a fish by yourself. Best methods: Floating line, Buzzers and bite indicators. Wind: Best in a Westerly; can sometimes be good with an Easterly. WITHOUT doubt the number one bank and boat spot on the lake. This is the most productive area especially early season when the majority of fish are close in on the banks. A great holding corner for stock fish. Seldom is an over-wintered fish caught from here. It seems to be that the nearer you are to the Gabien Wall, the better your chances. Best methods: Sinking and intermediate lines fished with lures. Wadeable? Only when water level drops. Wind: Any, but best with a West wind. A COMFORTABLE spot to fish with plenty of open bank, but very hit and miss. Not an area where you can bag up very often. More an area to pick up the odd fish. It does, however, hold fish in a West wind when it blows straight onto the bank. If you can perservere casting into the wind, this is your best time for bagging up. Best methods: Fish a team of wets in a good wave. Best times: All year but especially late season. IN past years this shallow bay with plenty of fly life was a great place to fish, especially when the wind blew into it. The fish, particularly browns, used to stay in the bay for long periods. In recent years, however, the area has gone very quiet, possibly due to the increase in pike. The bay is an ideal spot for them and now the trout stay away, venturing in only at fry feeding time. Best methods: Floating line fished with Buzzers under a sight bob. Try a team of flashy wets in the summer for the fry feeders. Wind: Best in a Westerly wind blowing into the bay. PROBABLY the least bank-fished area on the lake. Most days you can have the whole bank to yourself. If the wind is right, a team of Buzzers fished in a good ripple can reap rewards. Good chance of a decent overwintered fish here. Best methods: Floating line with Buzzers, or a team of wets in a good wave. Wind: Best in a Southerly. A GREAT spot in high Summer. The water pumped from the Usk enters the lake here and sport can be tremendous. The cooler water and extra food coming into the lake results in large shoals of fish gathering around this small area. Both sides of the inlet fish well although prime spaces are few and the early bird gets the good spots. Best methods: Slow sinking line with mini lures. Best times: All year, but especially good in high Summer when water is being pumped in. THIS is a very long bank, but the most popular stretch is the length nearest Sor Bay - especially around the hut. This year the area has started well with many anglers taking their fish very close in. Even the boats have been drifting within feet of the water’s edge and bagging up. It’s particularly good early season, but Summer evenings can also produce great sedge and buzzer activity. Best methods: Intermediate line with a team of mini lures and a Goldhead Damsel on the point. But if the fish are up in the water, try nymphs like Diawl Bach and PTN. Best times: All year, especially early season. Wind: Best in an Easterly. A NICE secluded bay always sheltered from the wind. This area used to be prolific, but in recent years catches have declined. One possible reason is that, again, the pike have moved in and so the trout have stayed away. Best methods: Floating line with a goldhead patterns like Damsels or Vivas. A PLEASANT spot to fish as you look out over one of the better views across the lake. Deep water close in, so fish can be caught without casting a long line. The Point can be fished in most winds, apart from possibly a strong Southerly. You can cover a lot of water from the point from Sor Bay and into Maes Mawr. There is a cabin situated on the point, great for having your lunch. In Summer it’s one of the nicest spots on the lake to spend a Summer’s evening. Best methods: Floating line fished with superglue Buzzers under a sight bob, and small flashers fished on a floater close to the bank at fry feeding time. Wind: Best with an East or Northerly wind. ANOTHER secluded bay. Can be a little difficult to cast at times because of the trees and high bank behind, although you don’t need to cast far as a lot of fish are close in. The top end of the bay is well worth fishing for a resident fish. The flooded trees and bushes hold good fish. Sometimes you’ll even get a shoal of stockies right up in the neck. Fry-feeding time can be good with dozens of fish seen crashing into the sides. With the introduction of cages on the outskirts of the bay, fishing has improved. Fish hold here all year now. Best methods: Floating line fished with Superglue Buzzers under a sight bob, or a team of wets casting along the bank in a good wind. Wind: Any wind, but best with a South or Westerly blowing into the bay. A DEEP-WATER spot with room only for a couple of anglers. 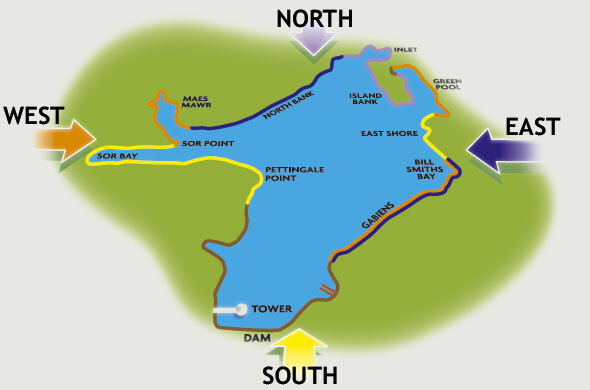 Known mainly as a good brown trout area, the Pettingale bank can be fished only at very low water level, so the point is the nearest access. A great spot for big resident fish, especially early morning. A fast sinker in high Summer will usually pull a few fish from this very deep water. One of the most likely spots to catch a resident brownie. Best methods: Fast-sinking lines with lures. Best times: April, May and September. Wind: Any wind is good, but can be difficult in an Easterly. North-Westerly can be best, blowing out into the lake.